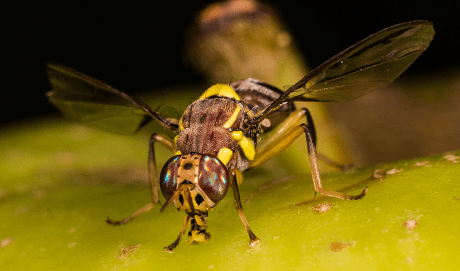 The Oriental fruit fly, an invading fruit fly that has been present in South Africa since 2010, has been intercepted in the Western Cape for the first time. Over the past three weeks. every week has turned up a single specimen of Bactrocera dorsalis in one of the many traps set up across the province. All of the fruit flies were found in the Grabouw area where the pear harvest is well underway and the apple harvest is just getting started. The first step after the detection was to do a delimiting survey in a 5km2 area (sometimes less, because areas aren’t made up of homogenous orchards) around the sites of the interception, to determine how far the Oriental fruit fly – which fortunately doesn’t fly very far – might have spread. It was found to only be present in the Grabouw area for the moment, where strict phytosanitary measures are now in place and the area is under quarantine for 12 weeks (although producers can obtain a permit to still market fruit from the area, if all phytosanitary measures have been followed). The Oriental fruit fly is polyphagous – its plant hosts could be any of the wide variety of fruit offered by the Western Cape and with the citrus season approaching, it is of particular concern. Rigorous orchard sanitation is followed, complemented by the male annihilation technique as well as protein bait which targets both females and males. Producers are obliged to notify authorities if the Oriental fruit fly is detected. Home gardens are equally under the magnifying glass, for it has been found elsewhere in the country, with mangoes for instance, that infected fruit in home gardens provided a haven and corridor for the pest. The Oriental fruit fly is already well-established in the subtropical regions in Mpumalanga, Limpopo and KwaZulu-Natal provinces, but until now the Western Cape was still an unaffected area. In November last year the Department of Agriculture, Forestry and Fisheries (DAFF) extended the description of the Oriental fruit fly’s distribution in South Africa in its measures, exactly with the aim of being better able to deal with new geographical interceptions of the notifiable pest. The national department works closely with organised agriculture, which aids immeasurably in its activities. Jan-Hendrik Venter estimates that there are between 1,600 and 1,700 traps set up across the Western and Northern Cape. 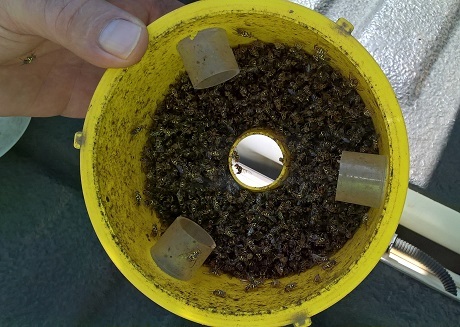 Since 2006 a national detection programme has been in place and it is a strategic aim of the department to keep track of introduced fruit flies, precisely because they establish themselves so easily. The focus is mainly on areas where the fruit fly has not yet been detected.